I bought the bundle. I applied the plugins to tracks on my recordings and it sounded fantastic. I went to several of my other songs and added chorus, filter and reverb. Once again marvelous. I took a break and went back to my remixes and then problems started. All tracks no play. Sometimes just drums and a guitar. Sometimes bass and drum. Keyboard tracks won't play at all. As I didn't apply the app to drum tracks and this issue hasn't occurred before, it must be app related. This app has high potential and the effects are great, but the above described problems renders it a bust. Hopefully this is a bug they can fix. I checked their website but couldn't find a link to contact them for support. I also hope this app didn't wreck some of my favorite work. If they fix this issue, then it's a Five-Star app. 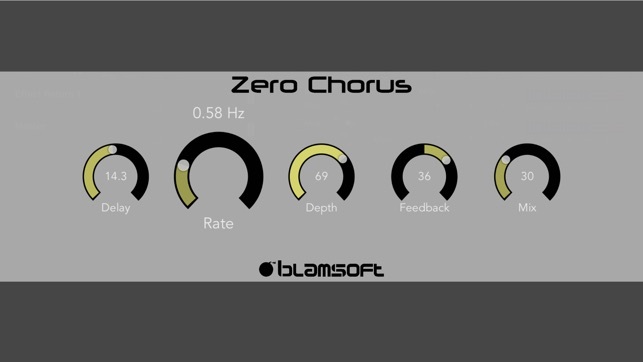 Both GarageBand and Zero Chorus have been updated since this review. It should be working properly now. Does this work with GarageBand? I bought this app but I can’t find it on the GarageBand extension. In GarageBand, tap "Plug-ins & EQ". Then tap "Edit". Tap a green plus sign button to add an effect in an empty slot. Then you will see "Audio Unit Extensions". 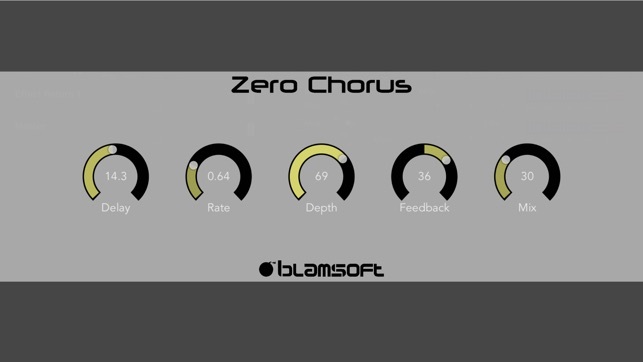 Choose Zero Chorus from the list.